The only book I've read this year so far has been Fallen Pastor by Ray Carroll, which I reviewed here. At some point, somewhere, somebody said to somebody else, "Hey, let's retell the story of 'Romeo and Juliet' using lawn gnomes and featuring the music of Elton John." And for some reason, the other person said, "Yeah, that sounds like a surefire hit!" As it turns out, this conversation did not happen in a college dorm room while passing around a cigarette with questionable contents, but in a boardroom at Dreamworks (which for all I know may be the same thing). The result is Gnomeo and Juliet, which Coffeeson has wanted to watch several times a day for at least a week now. Two rival yards full of lawn decorations go back and forth, Gnomeo meets Juliet, hopefully you know the gist. There is actually a lawn gnome who comes out at the very beginning and says, "The story you're about to see has been told...a lot." Indeed. James McAvoy, Emily Blunt, Michael Caine, Maggie Smith, Ozzy Osbourne, and Jason Statham are among those lending their voice talents. It's certainly not the greatest animated film ever made, but it did have enough cleverness to it--including subtle references to other Shakespearean works--that I didn't not enjoy it. 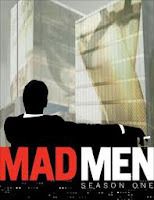 I've been meaning to get into the show Mad Men for quite a while now, and Coffeewife got me the first season on Blu-Ray for Christmas so I could do just that. After seeing the first few episodes, and I can't say that I really like any of the main characters yet. It has taken me a while to settle into the culture of the show, which is set in a time when men can get away with nearly anything in the workplace with their female coworkers and women's highest ideal is to become the best Susie Homemaker that they can possibly be. Everyone smokes like a chimney, and it's common to have an afternoon (or even morning) drink in one's office. We're meant to be particularly concerned with Jon Hamm's Don Draper, an executive in advertising who is brilliant at his job and has a good home life with a lover on the side. He's already shown flashes of depth, which I imagine will only continue as I get further into the series. All that said...I'm still trying to decide whether I like this show. Do I have any new music? Pshaw. I have some new music. Next, I downloaded the album For True by Trombone Shorty, who brings it with an upbeat New Orleans sound. He reminds me a lot of Robert Randolph, with a lot of different influences mixed together including funk, jazz, blues, rock, and hip-hop. Here's my favorite, "Dumaine Street:"
Speaking of Florence + the Machine, I've been enjoying her latest album as well, Ceremonials. It's blown me away with its driving tribal drums fronted by Florence's passionate voice, and has a surprising amount of religious imagery. Witness, for instance, this video for "No Light, No Light:"